To paraphrase one of the greatest smokers in the 20th Century, Winston Churchill "We shape our buildings. Buildings shape our society. And society shapes us". Though have you ever wondered why this is the case? Is it something to do with the price of cement? Or maybe it is something we can figure out in this one hour Channel Four documentary made in 2012. One time Carnaby Street rag-man, Irvine Sellar, plus a consortium from Qatar, have all invested in constructing one of the most talked about buildings in recent history. 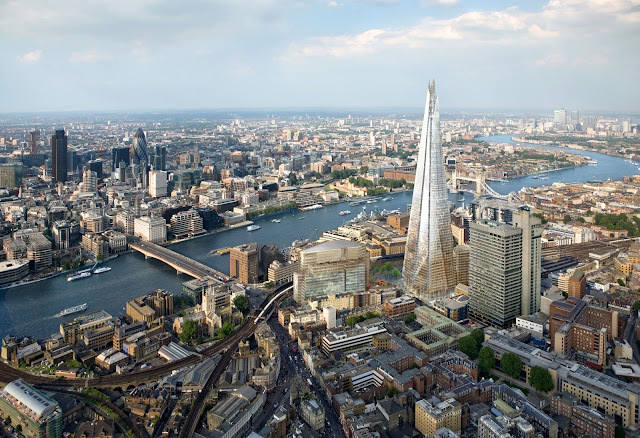 'The Shard' is its name, and this program narrated by Steve McSomething, tells the tale about how this enormous project took shape. What now follows is a brief run down of what this documentary is all about. Where is this building situated? Near Southward Cathedral, Borough market, Guys Hospital, and London Bridge train station. What was their previously? Southwark Tower. It took fourteen months to dismantle, one floor at the time. What is the Shard? It is a 1,1016 feet tall building situated in London Bridge, making it the tallest building in Western Europe. Who designed it? Italian architect, Renzo Piano, and British architect, Richard Rogers, both collaborated together on this project. Renzo past works include the Pompidou Centre in Paris. Whereas Richard works includes the Millennium Dome in London. What is the concept behind this structure? Aesthetically this building is like 'a shard of glass', whose spire-like form protrudes from the London skyline, recalling the church steeples featured in historic engravings. What Is Inside The Shard? The ground and the first floor is where the lobby is situated. The 2nd floor to the 30th floor are for offices. Floors 31 to 33 are a restaurant. From floors 34 to 52 is the Shangri-La Hotel. The 52 floor is the Spa. Floors 53 to 65 are for residential apartments. The 68th floor to the 72nd floor is the observation decks. And the 73th floor to the 87th floor is the Spire. How much did it cost to build? 1.5 billion pounds plus change. Were there any problems in building this building? Many. Both seismic and weather conditions had to be constantly monitored though-out the project. A risky top down construction method was used for simultaneous development. The old foundations had to be blown-up using special techniques. An innovative crane was developed for lifting materials up to the higher floors. Plus abseilers, oil riggers, jump-lifts, and other alternate paraphernalia, were utilised for things be carried out properly. Did any unforeseen forces interfere with any stage of development? Well, apart from a financial snafu at the beginning of this venture, a fox did penetrate the Shards structure, a water-dam broke, and a base jumper had somewhere to jump from. How long did it take for this scheme to be completed in its entirety? The land was bought in 1998, and it should be up and running by tea time, 2012. Now after living in the South Eastern quarter of London for the majority of my life, London Bridge train station has always been my midway point before travelling around England. If I want to go to the City - London Bridge first. If I want to go 'up north' - London Bridge fist. If I want to go to the toilette - Etcetera. Etcetera. Etcetera. So it is pretty safe to say that I have been given the great opportunity to witness how this central location has evolved over the years. I've seen Borough Market change from an earthy to trendy establishment, swapping it's clientele from working-class to urban-chic. I've also seen how Southwark has physically dipped and parried in temperament as well, inadvertently giving it a bohemian vibe that is one half pompous and one half grounded. Strange that though, isn't it? How a location can change over time whilst still staying relatively the same. Just like a human organism in fact. 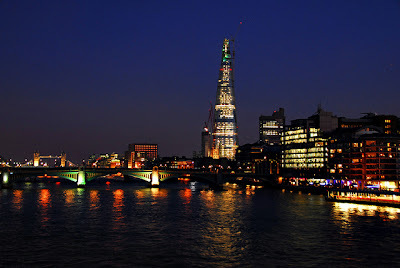 You see, that is what I find is at the heart of 'The Tallest Tower - Building the Shard'. Evolution. As if this project (plus those factors associated with it), somehow defines the nature of growth, and what people have to endure to accomplish something truly amazing. Many a year a go, when I first heard the news that London Bridge was going to be turned into 'Krypton', I thought to myself "Bloody Hell! Its going to look f*cking silly. A big bit of glass sticking out into the hemisphere!". However, like many other people who have had a similar reaction than I, over time I began to warm up to the idea, giving it the London 'fair dues', and hoping that everything will work out for the best. And do you know what? I was right you know. This building did work out for the best. It has given the people of Southwark (plus commuter and tourist alike) something to look at on a daily basis, inadvertently allowing them a way to come to terms with this rather striking looking abode. Well, change is the way of society isn't it. Nothing is ever original or new. London Bridge was once made of wood. Covent Garden was once a convent. And Buckingham Palace was once a theme park (just kidding about that one). Society as a breed have to realize that things have always changed with the times, or otherwise the world will become as stagnant as a politicians promise. Bloody lovely isn't it? But I don't think the same can be said for the stuck up nerks who can afford to live in this place. Stinking rich, yes. But 'lovely' I am not so sure. Unless they give me some of cash of course. Great documentary. Not sure about my review, ha!